You’d rather not go through life smelling like lavender. It’s nothing personal, but you’ve always thought your signature scent should be a little more rakish, a little more aggressive... and just a little more gin and tonic-y. 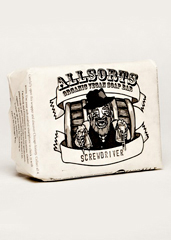 Introducing Allsorts Liquor Scented Soap, a set of four classic cocktails helpfully transformed into bars of soap, available now. It’s probably the easiest way to smell of booze early in the morning. Well, not the easiest, but it’s up there. Basically, it’s a cocktail in soap form. Just like last night, you’ll choose between a Screwdriver, a Gin & Tonic, a Whiskey Sour and a Spiced Rum spiked with cinnamon and anise. And note that, as with any drink, these are best shared with an alluring stranger. They’re the brainchild of a troupe of aspiring soapiers in Chicago, channeling their love of essential oils and alcoholic beverages into four high-lather bars. (That old story.) And since it’s from the land of Capone, you’ll get bootlegger-inspired packaging, replete with facts on Prohibition-era gangsters inside every wrapper.